Someone mentioned to me that she likes that I also review/record books that I've read and don't like. Well, this book is right up there for me. Back when guyczuk was in 4th grade, his teacher came to me one day, saying I had to read this book she'd just read. It was the best book EVER and she stayed up all night to finish it, crying as she read. Being the sort of mother who likes to see what makes her son's 24 year old teacher (who spent more time on the internet planning her upcoming wedding than she did teaching) tick, I borrowed the book. Sappy, tugging at your heart-strings, sentimental, pap. Totally unrealistic situation for an Alzheimer's patient, too, and I know from Alzheimer's, trust me. Things just don't happen like that, and I could not be charitable enough to engage the willing suspension of disbelief mode. If the writing had been good, I could have given it credit. But let's not go there. 1. I decided to give Sparks one more try. Nope. My opinion didn't change. You've heard of do not call lists? He's on my "do not read" list. I only BookCross copies of his book I've been given. Won't even pick them up second hand. 2. When the film of this movie was made here in Charleston, I had the chance to be an extra. As much as I would have liked that experience, I turned it down. And yes, I have NOT seen the movie. 3. One day I was in Books-A-Million. There was a huge crowd of women fluttering around an author. He was a clean cut, preppie-ish kind of guy (I remember that his blue shirt had an unfortunate white collar.) When I found out it was Nicholas Sparks, doing a book-signing, I tried to skirt around the crowd. His handler stopped me. "Don't you want to meet the author?" "But he's rather good. Have you read his books?" "Umm. Yes, but I'd rather not meet him." "You've read his books and don't want to meet him? Why not???" "I'd rather not say," I said, trying to break the iron grip she had on my arm. "He'll sign one for you." At this point, my struggling to get free caught the author's attention. He rose from his signing table, the red sea of women clustering around him parted and he came over to me. He was quite polite, and attentive, and inquired why I was so adamant about not participating in the book signing. Again, I demurred. He insisted. Did I like his book? Well-- no, not exactly. He pushed for details. I'd had enough and let loose with what I thought. To give him credit, he didn't blanch though his handler did, and I actually heard a hiss from one of the ladies in the crowd. He thanked me for my opinion, and said he would rather have someone who vehemently disliked his book that someone who said it was so-so. At least he'd stirred a strong emotion in me. To this day, that is the only thing I like about Nicholas Sparks. Sign into Goodreads to see if any of your friends have read The Notebook. I actually enjoy Sparks but I enjoy a good cry every so often. Actually my Mom who had Alzheimer's was quite similiar. Although she remembered me and my Dad until the end she would have times of great lucidity and then lose it. My experience (both personal and professional) with Alzheimer's is that there can be periods of great lucidity, or seeming lucidity, but not every night like clockwork. That, I found unrealistic. The regularity and certainty and perfection of each moment of clarity. The disease is such a heart breaker because of the repeated loss of a loved one, stretched out over time. It's on both sides of my family and is a tough one, no doubt about it. Probably my dislike of the book is rooted in my fear that I, too, will contract it and become a burden on my family. Actually my mom's lucidity was based on meals. After she ate she became more lucid. It is an awful disease which I have 2 markers for. My Uncle had it and it is horrible. I don't think he remembered things like clockwork either. It's hard to watch your parents die from anything. 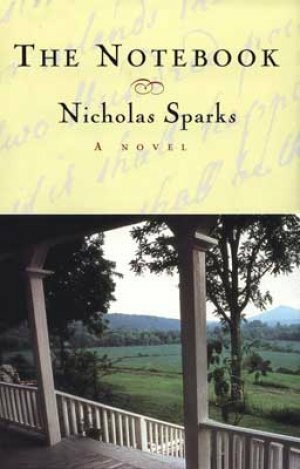 Yes, I'm with you I will never read one of Nicholas Sparks books ever again. I gave it 2 stars surprisingly most likely because I've read books that were worse. Yeah, I also agree it was incredibly sappy and bland. This may be because I'm not much of a person for romances. I honestly can't figure out why this book is so popular. I sort of had to force myself to finish it. I think you should try to see the movie. It is hardly anything like the book. It just took material from the book and made some much needed changes. If you like movies like Titanic, Atonement and Gone With the Wind, you may like this movie. I just highly suggest you give it a try. I only read the book because I loved the movie because deep down I am a romantic. I was expecting like most books to movies for the book to be better. Don't let the writer's horrible writing keep you from the movie. Oh, your review was hilarious. I can't believe you had to be in that situation at the book signing. I do suggest you see the movie, as it is entirely different than the book. I also HATED the book. But, on the other hand, the movie might be ruined for you since you already hate the book! But it would be fun to see my hometown on screen.... we'll see. Haha, nice story about the author. To be honest, I only read 10 percent of the book. And I feel it doesn't deserve any other second. Carolina wrote: "Haha, nice story about the author. To be honest, I only read 10 percent of the book. And I feel it doesn't deserve any other second." The only one of his books I've truly enjoyed was his memoir about biking with his brother. I tried another one or two of the fiction and can't stomach it. But apparently there is a market!